VANCOUVER — Mikey DiPietro’s eyes were as big as saucers. The only thing keeping his jaw from hitting the blue paint in front of him was his chin strap. Captain Comtois failed to convert on a penalty shot. The Finns thought it was over. Tolvanen said he couldn’t even watch on the bench. They survived. Then Noah Dobson’s stick exploded on a one-timer staring down a gaping cage, a sequence that will haunt his dreams for years. The puck squirted the other way, leading to an odd-man rush where Toni Utunen then Finnished off Canada. It was Utunen’s first goal of the season – at any level. Seriously. Finland 2, Canada 1. Overtime heartbreak in Van City. It’s not the way any Canadian pictured this tournament going because no one has ever seen it go that way. For the first time in history, Team Canada failed to medal in a World Junior Championship on home soil. 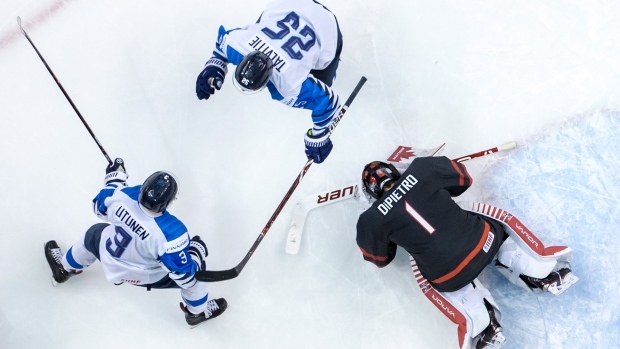 Canada will now finish sixth after being knocked out by Finland in the quarterfinal for the second time in four years. Some may call it Why Not Wednesday. With Switzerland’s shocking quarterfinal upset of Sweden, this is just the second time in the World Junior modern era (24 years) that neither Canada nor Sweden will be part of the Final Four. What it should just be called is the New World Order. There should be no scurry to call a summit for Hockey Canada to dissect this loss. It’s a global game now and the sour truth is everyone else is catching up. After winning a combined 27 of the first 33 World Junior gold medals, Russia and Canada have won just three of the last nine. This Team Canada entry was never billed as a bunch of world beaters. There were no real stars. They finished with a 5-3 record including the pre-tournament games, their most impressive wins were over Switzerland. They beat just the 7th, 8th and 9th place teams in the tournament and scored just twice in their last two games. But this is Canada and Hunter will be second-guessed to death for his decision to pick Comtois for the penalty shot. He practised the shootout more than any Team Canada coach ever and studied the numbers. “Max is our best shootout guy,” Hunter said post-game. Comtois did have Canada’s best shootout percentage, 3-for-7 in his QMJHL career. But Morgan Frost said earlier on Wednesday he scored on a breakaway on Ukka Pekka-Luukkonen this season in the OHL and “would love” one more chance on a breakaway. Owen Tippett scored on Pekka-Luukkonen four times this season. Of course, neither was a guarantee to score. The same could have happened to them. The tougher pill to swallow should be the thought that Team Canada did this to themselves. They allowed the ‘hockey gods’ to wreak havoc because they didn’t beat Russia in a game that was served up to them on a New Year’s Eve hors d’oeuvre tray. They watched Russia torch Slovakia 8-3 later on Wednesday night, a matchup that could have been theirs had they won Group A in the preliminary round. A win on Wednesday would have guaranteed Canada the chance to play for a medal, the chance to keep the streak alive. Instead, we’re left to wonder what could have been. What if Hunter picked someone else to shoot? What if Dobson’s stick didn’t break? What if Hunter changed up the first power play unit after it closed out the tournament 0-for-16? “What if?” They are two words, small words that will stick with these teenagers for a lifetime.